PRAG Realtors Broker Unit: Let us release you from overhead and unleash profitability! 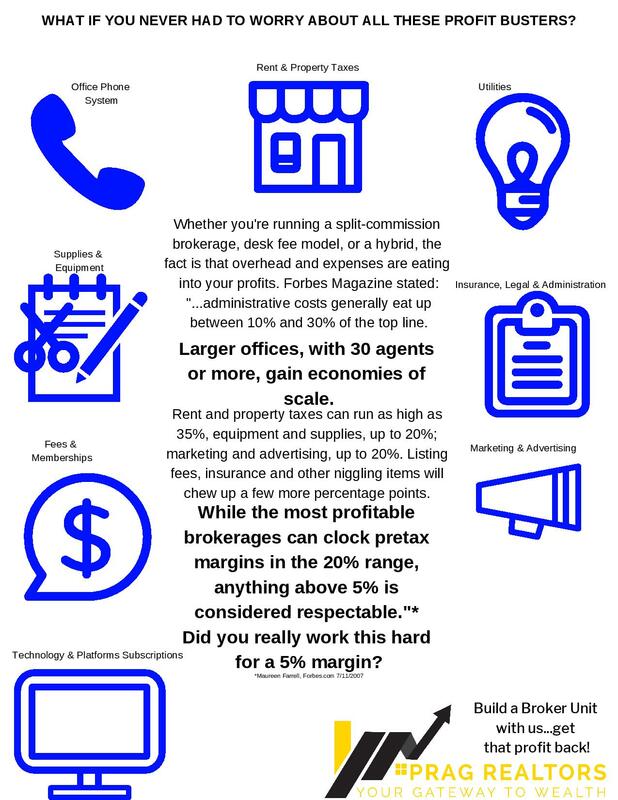 “The real estate professionals who investigate the feasibility of opening their own brokerage very soon realize the overwhelming overhead cost and significant amount of time required to handle the administration of the brokerage office. Moreover, additional resources are necessary to meet RECO requirements [or, DBPR, for Florida brokers] and be up-to-date with changes in rules and regulations. Generally speaking, most of them are successful as salespeople, and they prefer to be out there selling properties and not stuck in an office to shuffle through papers and accounting reconciliations. Further, we can appreciate that a good salesperson is not necessarily a good administrator, a good bookkeeper or a good manager for that matter. For these very reasons, there are a high number of successful real estate salespeople who do not dare to open their own independent brokerage despite all its advantages.” -James Hussaini, Founder & President, Realty Point. It’s important to consider a number of factors and ask the right questions when considering whether or not your brokerage is actually succeeding. A look at the numbers is the best place to start – numbers don’t lie! Have you done the math? Is your monthly GC revenue leaving you sufficient company profit each month after all the bills are paid? Download our easy worksheet to "do the math" and find out! If the answer is no…the PRAG Realtors Broker Unit Leader opportunity was designed with you in mind! How does PRAG Realtors invest in our Broker Unit Leaders and their group? Our Broker Unit Leader opportunity releases you from overhead and unleashes profitability! The competition that floods a local market can be difficult for a new brokerage, even with the backing of corporate franchise models, which often cannot provide emerging brokerages with personalized attention. With PRAG Realtors boutique Broker Unit model, it’s a team effort, not a lone wolf scenario. When we bring a Broker Unit Leader and their group on board, we have full transparency with regard to our values and how we do business. We consider everything we do to be an investment into your group’s career success. Our more than 20 years of experience in Broward County has proven to speak for itself. PRAG Realtors has strong partnerships with municipalities, townships and large local corporations for the acquisition and sale of properties throughout South Florida. We also work with local affordable housing agencies, teaching seminars to bring the dream of home ownership to life for 1st Time Homebuyers. We are proud of our collaborations with local non-profit organizations that serve this population living in South Florida in addition to the traditional real estate transactions and investor-based segment that we serve. The tech-world terminology of “plug & play” is probably the best way to describe it! Just bring your team and you can hit the ground running. We provide the systems and a streamlined, step-by-step onboarding process. All you have to do is plug your team into it. You keep managing and inspiring your group and closing deals… while WE worry about managing the business! A fully integrated Enterprise website with SEO optimized agent and Broker Unit group profile pages and bios to further enhance each Unit’s own internet presence with IDX-powered integration to their listings. Custom Broker Unit & Agent Websites with integrated CRM: Build your group’s brand with an online presence on a feature-rich, yet user-friendly digital marketing platform integrated with the broker’s database. All-in-one content, lead generation and email marketing tools. Manage your lead assignments and entire group pipeline easily on the go with a mobile CRM app. In-House Marketing Operations Specialist to get you and your agents up and running on all platforms with ongoing support and training, plus, we maintain an online library of curated marketing content, social media graphics, and TONS of other resources from industry experts… all at your fingertips on a shared access Google drive. This includes a done-for-you Blog, Email and Social Media content campaign every month! It even comes complete with follow up call scripts and campaign calendar ready for you to customize with your own branding for initiating cold contacts and nurturing your database for top-of-mind and ongoing relationship building. It all comes down to client satisfaction and making the deal happen for our clients. Dawn is committed to this and has taken a “whatever-it-takes” approach in getting her agents transactions to the closing table swiftly and ethically. She takes the same approach when approaching a new Broker Unit Leader prospect.